Interview with author Aaron Michael Ritchey + a giveaway! I met Aaron at the Romantic Times Book Convention in Chicago last spring at the Fairy ball (I have a great pic at the bottom of this interview) and we began emailing a bit this summer. I’m so glad I met him! I loved The Never Prayer. My review is after this post. Click HERE Where was I? Oh, yeah, Aaron asked for my honest opinion of his young adult novel and I said if I was going to do that I wanted to have my way with him on my virtual couch *tries to waggle eye brows* lol sooo, he was a good sport and agreed. I <3 this interview so much and hope you get a kick out of meeting Aaron and enjoy the hoops I make him jump through. And he is a great guy and giving 2 lucky commenters a copy of The Never Prayer! So, Aaron… How’s your summer been? Gone on any roller coasters or camping trips? Aaron: My summer has been outtakes from a 1980’s era music video about the rock star on the road, missing home, riding in the bus, pining over girls with really frizzy hair walking around in a cloud of hairspray. I smell Aqua Net and I melt. Seriously. I’ve been doing a ton of traveling with my job (I support awesome anesthesia documentation software), and I’ve been doing trips to promote my book, and I’ve been doing road trips with my family (thank you Nintendo DS, wherever you are) and I’ve been walking around in the desert. The Great Salt Flats in Utah is one of my most favorite places on Earth. Yes to roller coasters (Santa Cruz Beach Boardwalk) and yes to camping trips. My daughter Ella is as tough as nails. 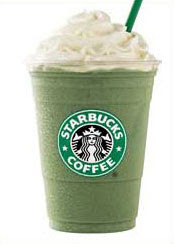 I’ll have a green tea frappuccino as well. I’ll drink anything frappucciono’d. Maybe not a boot-sweat frappuccino, but anything else. So….I finally read The Never Prayer (click HERE if you missed my review) and I’m kicking myself for not moving it up my TBR pile sooner. It’s a fast passed YA novel and once I started it I couldn’t put it down! I truly enjoyed the story and adored Lena. I was rooting for her and wanted to see her make better decisions. I loved the good versus evil, light versus dark, push, pull of the story and cared about the characters and the town of Avalon. What idea or spark started this story in your imagination and made it become a reality for us to enjoy? Aaron:Well, I was talking to a literary agent and she suggested I write an angel book. She knew I was Catholic and angst-ridden and so she knew that I could come up with something. I did, almost immediately. I kept thinking about how hard the world can be, and what it would be like to be an angel, trying to fix this hard, ‘ol world. Boom, then I wondered, what if my angel was an atheist? What if my angel couldn’t believe in God because the world can be so brutal? That was the inspiration, and then I wanted to put it in a Colorado mountain town, a girl in trouble, a demon who starts off being the greatest guy in the world, and bazinga, The Never Prayer. Glad you liked it. I loved reading and editing it. I cried every time. Aaron: Oh, Kat, this is the best interview ever! You answer your own questions and I do that when I interview people for my website! Loving you! Okay, enough exclamation points. Swear to all that is holy, you answered what I would answer. Stop time or teleport. If I could teleport, I could do book events all over the world and meet with friends and just rock the casbah. But I can’t take your ability, so I’ll choose telepathy. I love people and I would love to know what people are really thinking and who they are, deep down. In the end, I would imagine, we’re all pretty much alike, unless we aren’t, and then I bet that’s when things get strange. What are you working on now? Do you have plans for any more stories about Lena and the other students of Avalon? I really liked the Untouchables and Deirdre and Santiago too. Though honestly the ending didn’t leave me hanging (thank you!) I’m just greedy for another book from you. Aaron: I’m a guy who, um, likes to write lots of books at the same time. I’m the Sybil of fiction. So, I just finished a book about a girl and her grandmother, seeking love and adventure in France, and it’s a sweet book, but different than The Never Prayer. The working title, when I’m not calling it “The Grandma Book”, is Elizabeth’s Midnight. But I’m officially in love with the scifi western I’m working on now. It’s steampunk, it’s a cattle drive, it’s COWPUNK! Three sisters fight over a boy in the distant future where boys are rare and electricity doesn’t work. I’m calling it Dandelions, Guns, and Little Lost Souls. And yeah, I’m doing a sequel to The Never Prayer. Once I get my Dandelion book finished, I’m going to plot and write the sequel. Lena will be back, but this time she’s the angel. That’s all I’ll say. And you might see a novella about Chael and what he did before Lena and Jozey. I have a rough draft but it’s real rough. What’s the color of your favorite pair of shoes and how does that help or hinder your writing style? Aaron: My favorite pair of shoes are a pair of black boots I picked up in Paris, and they are wicked cool. Very Victorian. I slap on a pair of goggles and I’m steampunk fabulous. But they hurt my feet, so I can’t wear them as much as I’d like. So my writing life is fabulous and it also hurts. I just made up a word, Flimidity, what does it mean and how would you use it in a sentence? Aaron: Flimidity, n., the way the air feels when you are being scammed. The flimidity in the room skyrocketed when Alexander Dreuss pulled out his bottle of Dr. Elijah Wilde’s elixir. His promises came out eel-smooth. “It can heal the warts in your armpits or the lumbago in your lymph nodes. Tell me a story please …. Once in a blue moon, the king of Croon…. Sings of love and Costco. With only the jeans of his pocket. Whose Odysseus would return no more. Aaron: About that boot-sweat frappuccino, maybe just a drop. That last question made me awful thirsty. Spicy or mild? : Spicy Thai Hot. I want it all. And I want it now. Laptop or PC? : Just give me something I can save word docs on. Don’t care. Just don’t make me write longhand. Rain or snow? : Snow, a fireplace, and thou. Chocolate or vanilla? : Chocolate. Because God so loved the world… *snort* I adore you! Night owl or morning person? : Both/neither. I don’t sleep much. But I do believe that waking up early is stealing time from God. We’ll say morning person. Tv or movies? TV. Teacher, mother, secret lover. As Homer Simpson would say. Ebook or print? Gimmee words. Don’t care. I love me a good hardbound book, but ebooks make me happy because I can read so many and carry so little. Drink with an umbrella or in a chilled bottle? Decaf coffee and a little soy, ‘cause I don’t drink the alcohol. Booze and my soul just don’t mix. Aaron: I had a boffo time. Totally. I think I believe in God again. Me: I don’t think I want you to leave *pouts* Don’t be a stranger! Come back again now, you hear? Now that you’ve met Aaron read his bio, click HERE it’s pretty epic 🙂 You can’t stop the signal Mal. For more about me and The Never Prayer, you can visit us both at www.aaronmritchey.com. And of course, I’m on Facebook, as is the book at http://www.facebook.com/TheNeverPrayer. And I tweet – @aaronmritchey. Reviews can be found at the Goodreads page, http://www.goodreads.com/book/show/13565800-the-never-prayer . If you are at all curious about the novel, our friends at Amazon.com would love for you to visit them! HAPPY BIRTHDAY WEEK! On my birthday I always get a danish layer cake from O&H Bakery in my town. Yummy! I want a Danish layer cake!!! And yeah, in chocolate cake, it’s all about the frosting. Er, unless the cake itself is moist and deadly. But I love pie more than cake, gotta say. Cherry, apple, or cream, I love me a good pie. I love me some zombie mudslide. Start with a double-chocolate brownie (with chocolate chips, please). Pile on the mint chocolate chip ice cream (zombies are green, after all). Add strawberry sauce and maraschino cherries, hot fudge, put it all in a bowl, and slap a skull made of icing on top of that bad boy with a single gray candle through it (“‘Twas the zombie slayer with the lead pipe in the alley, my good sir!”). Goes great with Bailey’s Irish Creme, too, if that’s your thing (and it is mine). I loved this interview and it’s “off the wall” questions. It gets boring reading interviews full of “So, what was your inspiration for becoming a writer and how has that influenced your feelings toward your mother?” I like that this one was fun and it lets Aaron’s personality shine through. He really is a man whose love for life covers everything he does. Strawberries are usually in season for my birthday, so I like to make a big strawberry shortcake. I still use the same shortcake recipe from the Joy of Cooking that my mom and grandmother have been using for years. Tonight I’m having strawberries! But last night, my critique group made me a wicked peaches and blueberry cobbler. Get this, you take frozen fruit, anyting you want, put it in a pan, dump white cake mix over it, and then pour sprite over it. Seriously. It was good. Sprite-a-licious. About three years ago I moved away from cake and started my new tradition of a brownie ala mode! A big warm brownie full of nuts warm with a scoop of ice cream. February seems so far away now that I thought of how awesome it was last time. My favorite birthday treat is something my mom makes. It’s sort of like a lemony cookie cake. But it sounds SO MUCH BETTER. Seriously. I’m drooling now.